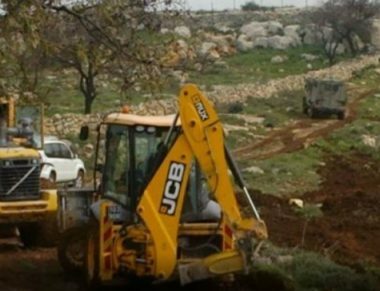 Israeli bulldozers, accompanied by dozens of soldiers, invaded Palestinian lands in Immatain town, east of the northern West Bank city of Qalqilia, and bulldozed nearly 30 Dunams of privately-owned lands, to expand an illegal colony. Media sources in Qalqilia said the soldiers surrounded and isolated the lands, located between Immatain and the illegal Immanuel colony, which was built on Palestinian lands, and started bulldozing them. They added that Israel intends to expand the illegal colony by annexing the Palestinian lands. Israel has repeatedly illegally confiscated Palestinian lands in Immatain in order expand the colony, which continues to grow into a “city” on the expense of the Palestinians. It is worth mentioning that Immanuel illegal colony was built on Palestinian lands, owned by the residents of Immatain, Deir Istiya and Jinsafut, east of Qalqilia. All of Israel’s colonies in the West Bank, including those in and around occupied East Jerusalem, are illegal under International Law, and various treaties, including the Fourth Geneva Convention, to which Israel is a signatory and a constant violator.